As part of The Duke of Edinburgh’s Award (DofE) and Dallaglio Foundation’s partnership, ‘Powerful Together’, Mowden Park was pleased to welcome Former England World Cup Winner and Founder of the Dallaglio Foundation Lawrence Dallaglio OBE to the Northern Echo Arena. 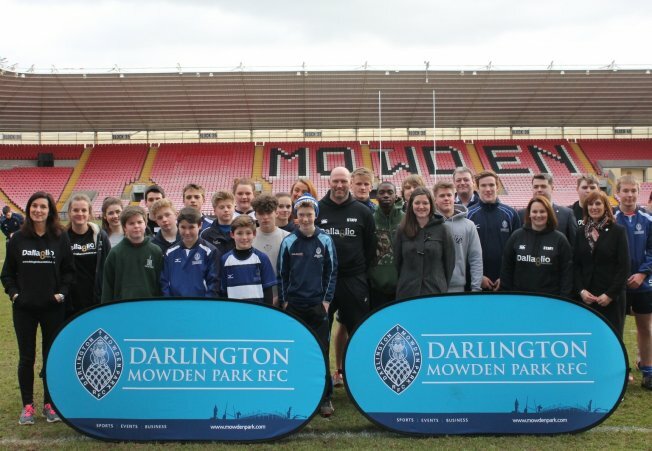 Lawrence paid a personal visit to mark the formal launch of the initiative that is working in conjunction with Mowden Park Community Scheme to allow young people from the local area an opportunity to start their DofE. Established in 2013 the ‘Powerful Together’ partnership sees the Dallaglio Foundation link up with the DofE Charity to encourage rugby clubs to run the DofE programmes for its young rugby enthusiasts and community members. Aimed at participants aged 14 to 24, the DofE uses different activities and outdoor pursuits to encourage the development of key life skills such as confidence, commitment and team working. As founder of the Dallaglio Foundation, Lawrence stated “I know the power sport has for social change and I want to share it with young people, giving them the chance to find their own success, which is my charity’s key focus. The Duke of Edinburgh’s Award is the perfect way to help achieve this.